At 6:00 I cranked the Tigress manual windlass until the 25 kg Kobra anchor clanked loudly onto the bow roller. Tied the anchor down and motored out on a clear calm day. What looked like a 36-foot sailboat was about 500 metres in front of me headed toward the anchored ships. 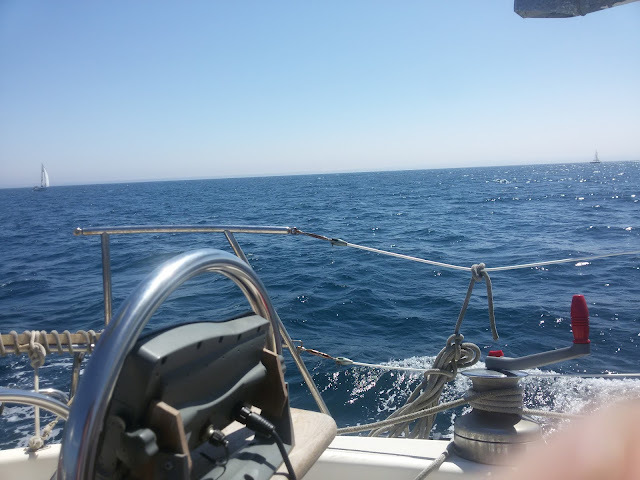 Although I was motoring at only about 5.5 knots, Jakatar slowly gained on it and then passed it. After that he began tailing me. About 45 minutes later, I turned into the wind to raise the main and stay sails and he did the same, except for a staysail which he didn't have. When I unfurled the genoa and shut down the engine, he did that too (I'm assuming he also cut the engine). Against all logical odds, he tailed me all the way to Cape St. Vincent, always within less than a mile, sometimes coming very close. He must have been solo too because I never saw more than one person in the cockpit. A couple of hours later another sailboat popped out of nowhere and joined the party for a long time. Strange but fun! The boat on the left tailed me for 55 miles, from Sines to Cape St. Vincent. The boat on the right stuck with us for nearly half of the trip. It's a one-in-a-million shot that a sailboat could tail another one for 55 miles without either using the engine or slowing down on purpose. But it happened. In late afternoon, about 10 miles from the cape the wind rotated from NW to N, the ocean got rougher, and the genoa started the "empty-fill-bang" routine, which drives me nuts. After furling the genoa and dropping the staysail, I eased the main to the spreaders and ran for it all the way past the cape, almost dead downwind with a preventer set up, of course. 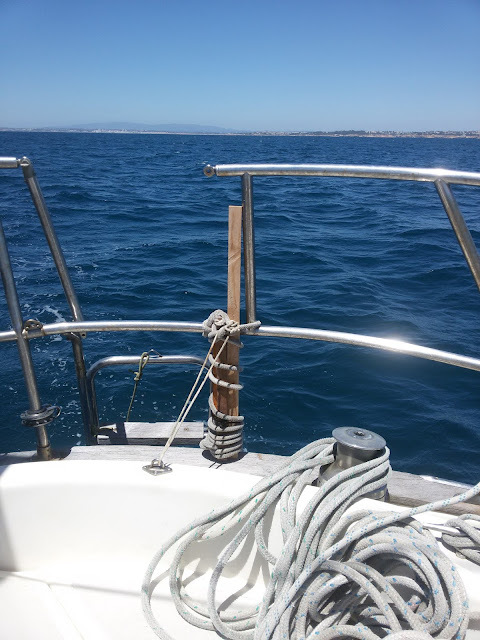 I could see the familiar wind-whipped whitecaps ahead, but I wasn't too enthusiastic about reefing right about now, which required turning 180º into the wind and lumpy waves. I kept sailing southeast instead. That would take me into stronger wind but calmer waters sheltered by the cape where I planned to reef and raise the staysail again. So much for the plan, I just kept going SE, farther from land. As I gradually turned east toward my destination, the boat took the wind on the beam, healed over, dug its bow into the water, wanting to turn into the wind, stubbornly refusing to respond to the rudder. Lobster pots were popping up in my path and I was getting nervous, not having much control and with visions of snagging a line on the prop or rudder skeg doing 6.5 knots and out of control. Then I raised the staysail with surprising ease and my speed shot up to over 7 knots. I was having a riot flying along dodging pots until a crazy little wave smacked the hull, shot up and soaked me while I was answering the phone. One boarding wave, one phone call, and they happened at the exact same time. The phone survived. 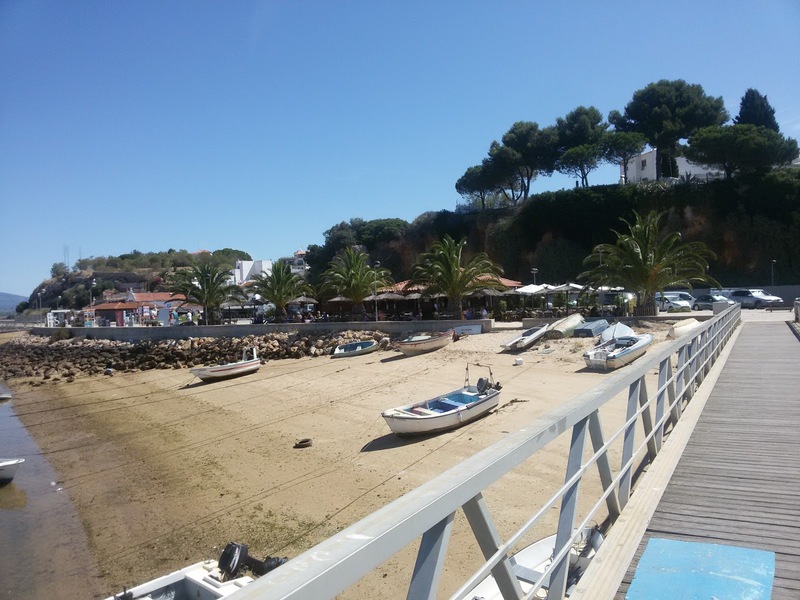 It's 20 miles from Sagres to Alvor, the sun was sinking quick, I was wet and soon began to shiver. Punched the auto button, dove below, grabbed a coat and a couple energy bars and I was good again. Then it's getting dark and I have to dive below again to switch on the running lights. The wind isn't letting up like it should near Lagos and I've had enough excitement for one day. By the time I round the Lagos headland and head for the Alvor entrance, it's really dark and I know this place is a minefield of pots. 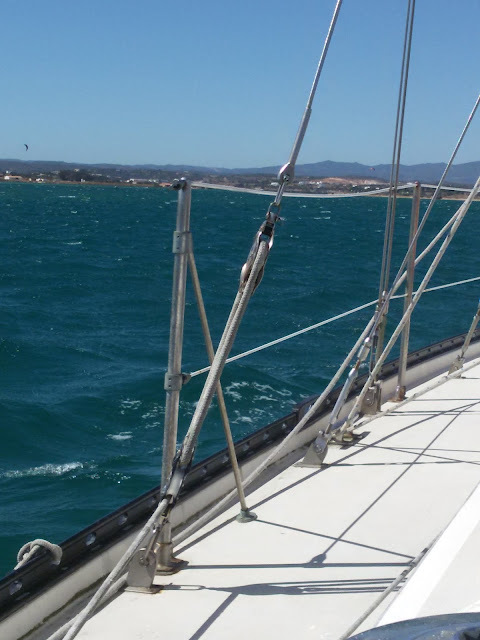 I sail on a close haul right up close to the pitch black Alvor entrance, turn into the wind and drop sails without a hitch, and slowly motor in between the two long rocky sea walls. It's too dark to go all the way into town so I anchor where the channel opens up into the lagoon in the company of two other boats. It's been a 16-hour trip and I'm floored, but feeling very much alive. 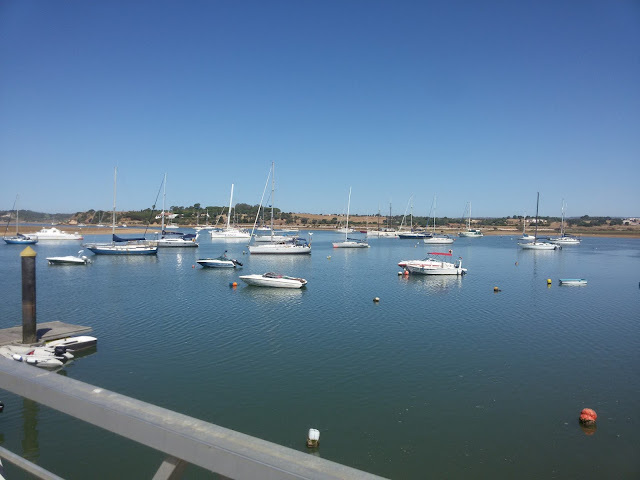 I woke up to a beautiful calm morning with an urge to dinghy into Alvor, the town, before sailing toward Culatra. Alvor anchorage on a peaceful morning. The local Alvor marina for small craft. Felt good to walk on land after spending over 3 days on the boat. Possibly one of the most photographed dogs in the world. He spends most of the day like this watching the crowds walk by. He was here last year, exactly in the same position. I walked around town looking at straw hats, got hungry and had an ice-cream, thought about eating grilled sardines but changed my mind when the wind picked up. 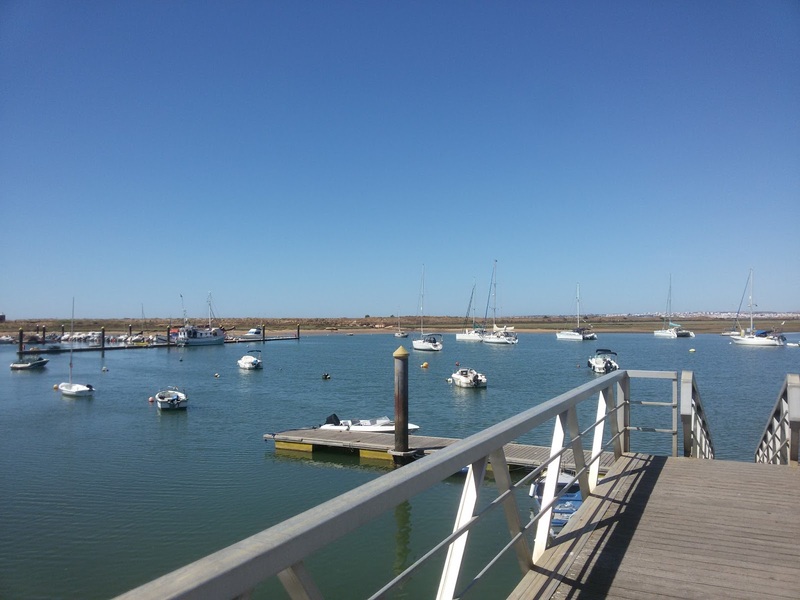 By the time I finished lunch on the boat, the wind began to blow hard, as you can see by the whitecaps in the anchorage, I lost my enthusiasm for removing the outboard, stowing the dinghy and raising anchor. Screw schedules. But later I wish I had gone. It blew hard all afternoon and night, too windy to dinghy into town. I spent the day watching kite surfers and strengthening the damaged stern rail. The pipe holding the ladder is severely cracked. I cut some wood pieces to hold it up and inboard. In any case, I started using the fender step at midships to hop on and off the boat. It works quite well, just like at the marina. I can stand up in the dinghy and place the outboard flat on deck and hop aboard quite easily, better than climbing the ladder with one hand and precariously holding the outboard by the tips of my fingers. In 16 years I never considered this option. Sometimes I'm so dumb, it's hard to believe. So now my ladder is an ornamental piece except when swimming, can't use the fender step to pull myself out of the water. The next day, instead of the usual calm morning, it was still blowing hard, so I did what I should have done the day before and sailed for Culatra in one fast tack. What a wonderful sailing expedition description. 16 hours is a long sail! At least you had company. It's really weird/odd when you're the only one out there. It's like everyone knows something you don't know. White caps in the anchorage means 20+knots.... not really inspiring to raise anchor and head out for a bruising. I make no promises and schedules when out mini cruising... I just take it how it feels to me. If it ain't good, it ain't gonna happen. Are you sure that dog is still ... alive?? That's a good point about the dog "still being alive". 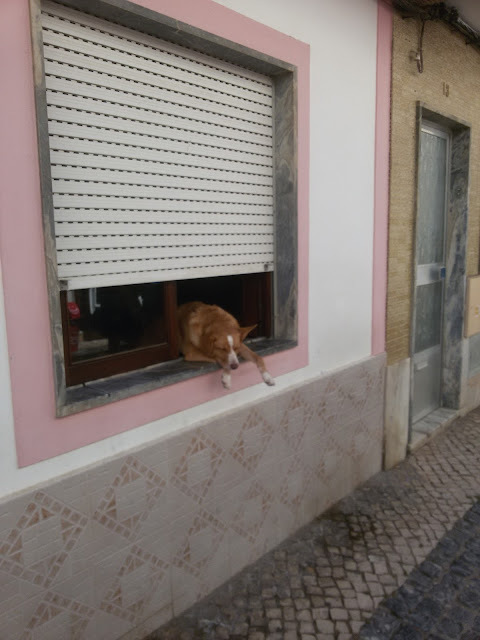 On my way back I'll stop in Alvor again and I'll be sure to tap him on the nose. If he bites me, I'll blame you!! !